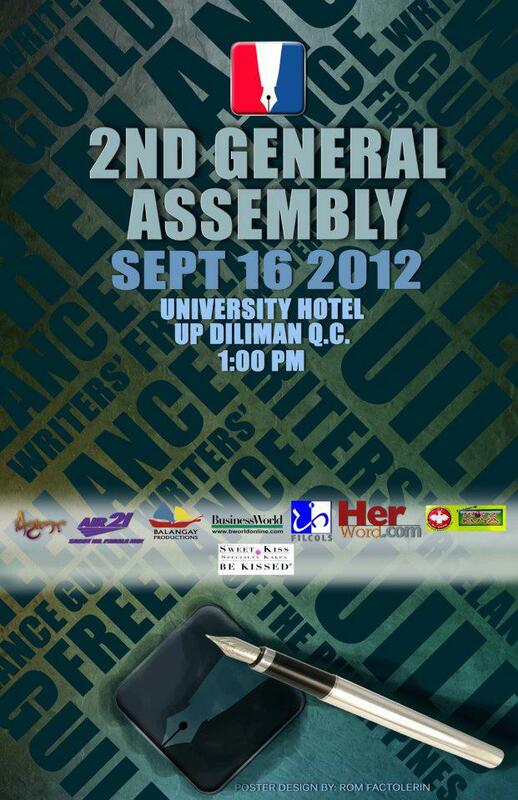 The Freelance Writers’ Guild of the Philippines (FWGP) will hold its Second General Assembly from 1 p.m. to 6 p.m. at the University Hotel in UP Diliman on Sept. 16, 2012 (Sunday). The members of the organization will be given an overview of the current local freelance writing landscape by seasoned freelance writers, representatives of client companies and select FWGP members. Guest speakers include Celine Roque, Sharon de Dios, Noemi Pamintuan-Jara, and Bert Sulat; client speakers: Ces Rodriguez of Yahoo.ph, Camsy Ocumen of freelancer.ph and Yasmin Arquiza of GMANews.TV; and panel members: Beverly Siy, Stephanie Gonzaga and Dino Manrique. Facilitators of FWGP committees will present reports: Education, Ime Morales; Marketing & Resource Mobilization, Claire Agbayani; Web Site & Media, Rom Factolerin & Raymond Dimayuga; Membership, Teena Estrada; Finance & Ethics, Naomi Tupas. Executive Committee members Lorna Israel and Karl de Mesa will give the invocation and deliver the closing remarks, respectively. Results of the survey on rates for freelance writers which was conducted among FWGP members will also be revealed. The event will be hosted by Angel Carballo and Viva Andrada. Members Charlie Morales and Peter Allan Mariano will perform during intermissions. The Second General Assembly of FWGP is supported by FILCOLS, Business World, herword.com, Agimat, Tindahan ng Itlog ni Kuya, Michelle’s Sweet Kisses, Balangay Productions and Air21. For inquiries, contact: Teena Estrada (+639153913129) or Naomi Tupas (+639223185858).